Mosquito Hostel is very centrally located just next to the north entrance of Old Town, putting it within walking distance of all the major sights. 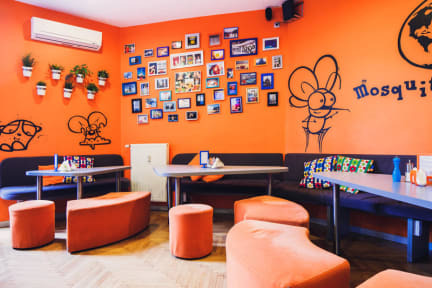 This modern, friendly hostel features free nightly dinners, drinks, games and events - a great opportunity to meet the staff and fellow travellers. There's also a fully equipped kitchen, free breakfast, free laundry and free Wi-Fi and Internet. We like their discounted tours of Auschwitz, the Wieliczka Salt Mines and Zakopane. Great stay, very social and lively, ideal for solo travellers. Close to the old city. This was my best hostel experience ever, I fell in love with Krakow, and I think the hostel played a big part in this. Perfectly clean, and the staff are amazing, they really go out of there way to make your stay comfortable and to integrate everyone together. It was like a family and I was very sad to leave! Will head back over summer just to see them again! Right, where do I start? This was my first ever hostel stay as I'm usually a hotel stay guy. But I decided to try out the hostel and I was very surprised when I walked in to Mosquito. It was very clean and tidy. I cannot praise enough of the staff who run this place, one word - Awesome! The staff at mosquito make this place a fun place and they always kept the place clean and tidy. They were very helpful as it was quite daunting walking in for the first time but they made it easy for me. The best hostel I have ever stayed! Great staff, great activities, great people. The best hostel in Krakow in my opinion! Pretty much everything you’d want for a hostel. You can party, you can rest, the staff are SO wonderful and location wise it’s next to a 24 hour store and very close to the old town without being engulfed in it. You’d be silly not to stay here! I loved this hostel! Had a very welcoming vibe and comfortable atmosphere I would definitely recommend it and stay there again. One of the best hostels I have been to! Really good hostel. Don’t judge it by the alley and stairwell (it’s just extra security). Really social environment and staff were lovely. FREE breakfast and laundry and they did it for you. The toilets and showers were really nice and clean. No complaints! Excellent for a solo female traveller, great location. Walking distance to the train and bus station. Breakfast included and a great variety. Lovely little hostel in a great location. Staff were always present and very helpful. The hostel only consists of a few dorms so it’s great for solo travellers, there’s also hostel events each night of the week. The free breakfast was good too! Only negative is that there is no locks on the dorm doors. There is a secure main door into building and then hostel itself but anyone inside can then enter any dorm.